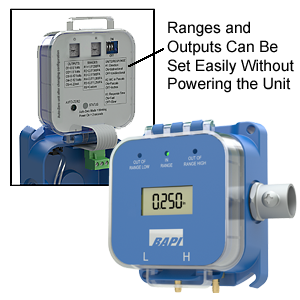 BAPI’s Zone Pressure Multi-Sensor is the most flexible pressure sensor on the market. Output, range, units, directionality, and response time are quickly set in the field with no tools, no power and no small components. The optional LCD display helps with troubleshooting because it displays the actual differential pressure over the entire operational range regardless of which individual pressure range is selected for output to the system controller. Three LEDs on the face of the unit indicate when the pressure is “Out of Range Low”, “In Range” or “Out of Range High”.